I don’t always set new goals at the beginning of each year. Some years, I roll over goals that I didn’t accomplish from a prior year, and then I try to focus on reaching the goal. Goals should scare you a little or a lot. You need some added energy. If you’re not a little nervous, then your goal isn’t challenging enough—it sounds more like a simple task or shopping list, which may not help to build your confidence. Goals without deadlines are just dreams. It doesn’t matter if the deadline is missed, but if you don’t place a date next to the goal, you won’t be motivated to achieve it–you will keep procrastinating and putting it off. If you don’t tell at least one person your goals then there’s no one holding you accountable, supporting you, and celebrating your accomplishments when you reach the finish line. So tell someone. 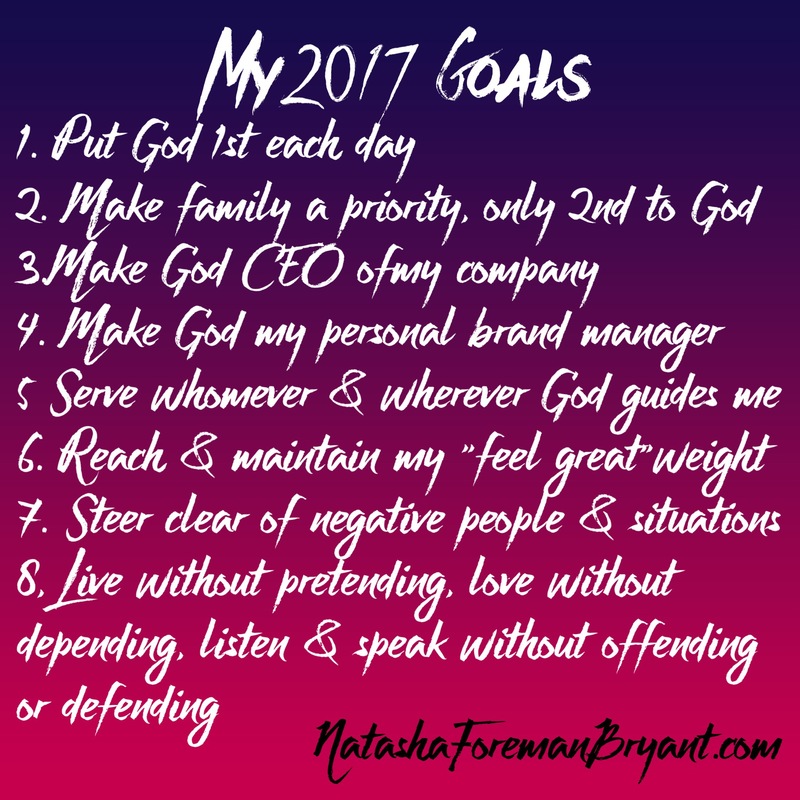 If I can consistently achieve these 8 goals by the end of the year, then I intend to make this my lifelong guide to living fully in each moment of every day. I believe my goals fit the prescription: they are lofty and scary, I’m giving myself until the end of this year to accomplish them, and I’ve now shared them with all of you. If you’ve noticed, all of my goals require daily work and engagement on my part. They require me to be receptive and present in my life, and there’s absolutely no room for laziness or casualness. Have you set personal and/or professional goals for this year? Share them with someone and then get out there and get to work! Copyright 2017. Natasha Foreman Bryant. Prev Post: I’m a Proud New Mother!